Prepare the sprouts by removing the outer leaves if damaged, and wash thoroughly. Steam or boil until tender, and place in individual ramekins. Crumble the cheese and sprinkle on top of the sprouts, then add a spoonful of breadcrumbs to each ramekin. Clarify some butter in a pan (fry gently until the foam subsides), then pour one tbsp over the breadcrumbs on each pot. Finally sprinkle a teaspoon of crushed walnuts and bake in the oven for 10 minutes at 220C. Grill for the last two minutes. Decorate with a whole half walnut and serve hot. Soak the bread with the milk in a bowl. Place all the ground meat in a bowl, season with salt and pepper then add the bread (after having squeezed out excess milk), the shallots, the spices and the eggs. Mix very well and then add the chestnuts. Season the inner cavity of the goose with salt and pepper, stuff with the chestnut meat mix and sew it closed. Season the outside and place it side down on a roasting dish. Add to the pan the diced vegetables (onion, carrot tomatoes) and the chopped giblets. 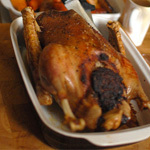 Cook for 40 minutes at 180C, basting every 10 minutes. Turn the bird on the other side and cook for a further 40 minutes. Turn on the first side again and cook for 30 minutes, then on the second side again for 30 minutes. Finally turn on its back and cook for ten minutes, then breast side down for a final 10 minutes. Remember to baste regularly. Transfer the vegetables to a plate, then strain the cooking juice and put in a sauceboat on the table. Serve with the goose. 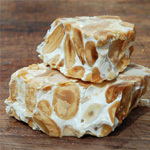 This beautiful soft nougat will make a delicious gift for any sweet-tooth! Beat the egg white until very firm. Then gently add the honey and keep beating until light in colour. Stir in the sugar. Cook on a low heat (this is best done in a copper pan) until it reaches a firm consistency. Remove from the heat and add the roughly chopped nuts, stirring to mix well. Sprinkle a cold surface with the ground hazelnuts. Pour the mixture over this, cover with more ground nuts and shape into a rectangular log.